SEOUL, Sept. 6 (Yonhap) — CJ E&M said Wednesday it will build a complex in Goyang, just northwest of Seoul, by the end of 2020 to promote South Korea’s cultural content, better known as hallyu. 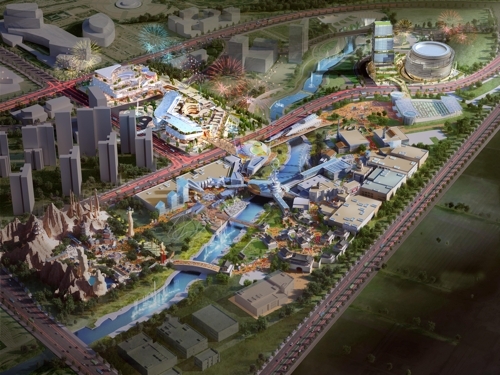 South Korea’s leading entertainment content and media company said it will invest 1.4 trillion won (US$1.2 billion) in the construction of a theme park, a shopping mall, lodging and other commercial facilities on 300,000 square meters of land within HallyuWorld. The complex site is located near the SBS and MBC television studios, South Korea’s largest exhibition center KINTEX, a large lake park, Paju Printing and Publishing Industry Complex and Heyri Arts Village. It is accessible within 20 and 35 minutes from Gimpo and Incheon international airports, respectively. Tourists can also reach the complex in about 40 minutes from downtown Seoul. The complex will have a 4DX theater providing various chair-embedded sensory effects, such as puffs of air, scented mist, seat motion and vibration as well as Screen X which allows moviegoers to enjoy a realistic cinematic experience without wearing 3-D glasses. In addition people visiting the complex will get to experience the latest advances in artificial intelligence, virtual reality, robotics and other state-of-the-art technologies. The Goyang city government expects the complex will create 25 trillion won in economic effects for the coming 10 years while employing 170,000 people. The complex will help globalize hallyu and further promote sustainable development of South Korean culture, he said.